A major goal of the Tanzanian extension service is to improve the agricultural productivity of the more than 75% of the nation’s 46 million inhabitants who reside in rural areas and depend on agriculture as their main form of livelihood. These extension workers are trained at one of Tanzania’s Ministry of Agriculture Technical Institutes (MATIs). Through the MATI’s, the Ministry of Agriculture, Livestock, and Fisheries (MAFC) trains frontline extension workers at the Certificate and Diploma levels, who then are deployed at the village, ward, and district levels to provide extension delivery to these rural populations, especially smallholder farmers. However, concerns have been expressed by MALF, Ministry of Local Government, and other external stakeholders about the quality of the graduates being produced through the MATI’s and their lack of skills necessary for contributing to agricultural and rural development. This is the impetus for a new project led by the Office of International Programs in Agriculture (IPA), working in conjunction with other faculty in Ohio State’s College of Food, Agricultural, and Environmental Sciences (CFAES) as well as the Sokoine University of Agriculture’s (SUA) Department of Agricultural Extension and Community Development, to improve the training that is provided to the trainers of extension agents at the MATI’s. This project, formally entitled “Improving Rural Outreach Capacity in Tanzania: A Pilot Curriculum Reform Initiative to Increase Relevance of Trainer Training”, is partially funded by a 2016 Impact Grant from the Office of Outreach and Engagement at Ohio State. It serves as a pilot study centered on one MATI in particular – Ilonga. Ilonga is a MATI located in the Kilosa district, approximately 100 km west of Morogoro where the SUA campus resides. 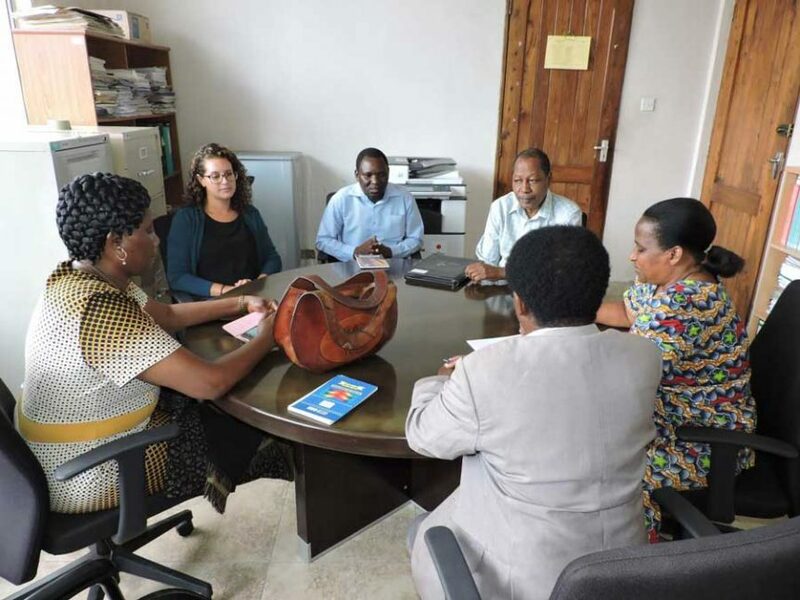 The project’s immediate objective is to revise the programs of study at the MATI – Ilonga so that it can better reflect the changing needs of Tanzania’s agriculture and improve the performance and employability of its graduates. In addition to Dr. Hansen, the CFAES project team includes Dr. Mark Erbaugh, Director of IPA and Principal Investigator on the project; Dr. Graham Cochran, Professor and Senior Administrative Officer in CFAES; Dr. Mary Rodriguez, Assistant Professor in the Department of Agricultural Communication, Education, and Leadership (ACEL); and Dr. Barry Ward, Assistant Professor and Leader of Production Business Management in the Department of Extension. Drs. Hansen, Cochran, and Rodriguez initiated the project’s activities during a July 2016 visit to Tanzania where they worked with members from SUA and MALF to complete intensive project planning. During the visit the team also learned more about the MATI and Livestock Training Agency (LITA) system, including needs, opportunities, and the formal curriculum validation process required to make official changes in the MATI or LITA curriculum. “What the Ohio State team is really aiming to do is to broaden the network of stakeholders, including those from the private sector, who can be engaged in the training process with our other Tanzanian partners to bring about sustainable, positive change to the way in which MATI’s train their extension workers,” says Dr. Mark Erbaugh, who has worked in East Africa for more that twenty years on projects related to higher education capacity building, agricultural extension training, and integrated pest management. This project with the MATI’s emerged from and is partially supported by the ongoing Innovative Agricultural Research Initiative (iAGRI) – a major Feed the Future project funded by the U.S Agency for International Development (USAID) and administered by The Ohio State University through IPA since 2011. iAGRI maintains a project management office in Morogoro on SUA’s campus. Going forward the project will complete a needs assessment to describe current trends in agricultural extension work in Tanzania, competencies needed by front line extension workers, and the training gaps to be overcome. A set of recommendations for curriculum revisions and staff development will then be developed, followed by two initial short courses for tutors at MATI Ilonga in January, 2017. It is through this and other collaborative efforts that Ohio State, along with its longtime partners in Tanzania, strives to further bolster Tanzania’s ongoing progression towards food security and improved livelihoods.